Joël van de Rhoer, nicknamed ‘de Dikke’ (fatty) was born in Meppel on the 4th of December 1877, son of Abraham van de Rhoer and Matje Glazer. Like his two cousins he was a cattle trader; the three controlled the trading of cattle in Meppel and the surrounding areas. To make a distinction between the two Joëls they had nicknames, very common in Meppel in those days: Joël ‘de Rijke’ (the rich one) and Joël ‘de Dikke’ (the fat one). Joël spent his life as a bachelor, but that nearly worked out differently. It is not often that a wedding in Meppel was cancelled at such short notice. It was really Joël’s intention to marry Hendrika Goldsteen. Everything had got ready for the marriage ceremony, which would take place on the 24th of December 1904. 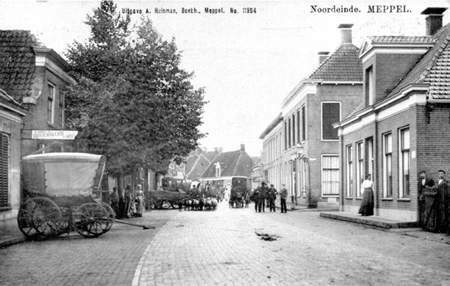 On that day the couple and witnesses would go to the town hall on the Hoofdstraat for the civil ceremony. 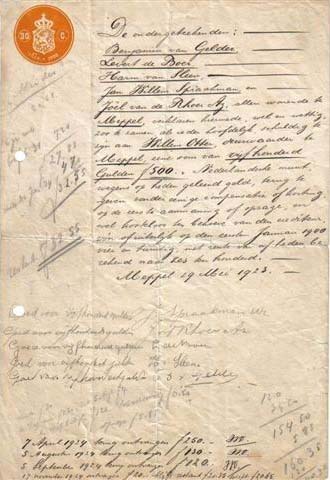 The witnesses were Salomon Goldsteen (brother of the bride), Coenraad van Es (brother in law to the groom), the municipal beadle Harmelink and the municipal secretary Hendrik Willem van Dijk. A case of skilful fraud in the city. A young man, named Joël, who was already engaged to the daughter of a widow here for many years, traded in cattle. According to him his business prospered. Joël was a man the farmers liked to deal with; he was the man who had the most attractive contracts. Much money was needed, more than Joel could afford. The girl’s mother had a small capital so we are told, a sum of fl. 1500,- which was invested in the business of her future son-in-law. Also acquaintances of the mother invested a sum of one hundred guilders in the solid speculations of the young man, who closed contracts with lots of different parties. Recently the young couple would get married. Bride and groom had rented a small house, nicely furnished. The purchases for the wedding had already been done. The guests had already received their invitations. But, just before the blessing of the marriage the mother was informed about the solvability of Joel. The truth came out. All the profitable contracts, all the nice purchases, the fantastic sales, had merely existed in his imagination. The wedding was cancelled. Joël disappeared; no one knows his whereabouts. The state of the bride, her mother and all who trusted Joël with their savings, can be imagined. Were these dramatic events the reason why Hendrika spent her days in psychiatric institutions since 1910? On the 15th of July 1910, Hendrika was admitted into a psychiatric institution in Groningen with mental problems. She remained there until the 2nd of January 1911. Unfortunately the treatment that she received from Prof. Wiersma had no result. A request was made to the Israelite Institute for the Insane, the ‘Apeldoornse Bos’ and for a similar institution in Zuidlaren, but it was refused due to lack of space. Eventually a place was found for Hendrika at the ‘Oude en Nieuwe Gasthuis’ (a Medical Institute for the ‘Insane’) in Zutphen. Hendrika remained there until her death on the 15th of January 1943. Joël died at the age of 65 on the 19th of January 1942. In any case he was saved from being transported to Westerbork. During his life he lived in many places in Meppel; 11 Vledderstraat, 20 Voorstraat, Keizersgracht and many more addresses, (see the Dutch text). 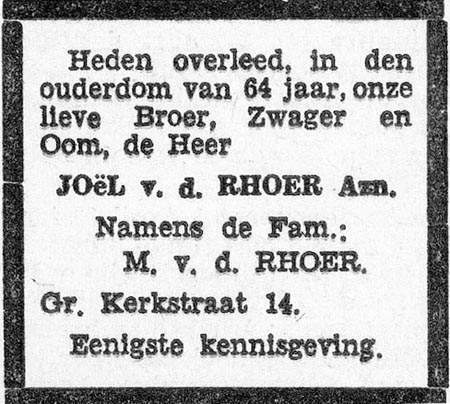 The gravestone of Joël van de Rhoer, who died at the beginning of 1942. In 1923 Joël was mentioned in the national press when the football club ‘Alcides’ of which he was chairman, had a conflict with the local council of Staphorst, because of playing football on a Sunday. He was convicted for breaking the ‘Sunday Observance Act’. Benjamin van Gelder and Joël van de Rhoer were two of the five persons who lent Alcides fl. 500,- in 1923. The reason was that the football club had financial problems at that time. Noordeinde, where Joël van de Rhoer spent his last years.